A wealth of enchanting sites lend themselves to strolling hand-in-hand in Paris. Our favourite routes take us through the Parc de Bagatelle, close to your Hotel Auteuil Tour Eiffel Paris, or the Parc André-Citröen; two delightful public green spaces. It can be a little chilly at this time of year but Paris offers a thousand and one indoor activities. For the evening of Valentine’s Day, the Maison de la Radio presents a concert of pop and jazz standards by the Radio France Choir accompanied by David Linx and his trio. Book now through our team. 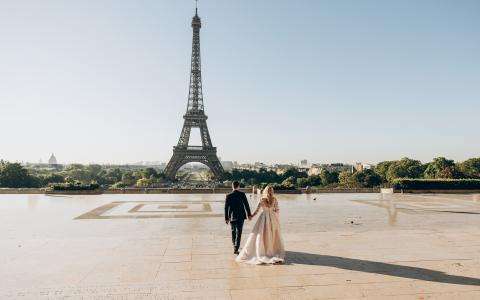 Paris is also the ideal city in which to declare your feelings; head to the cobbled streets of Montmartre and its Wall of Love, the top of the Eiffel Tower or the Arc de Triomphe to pop the question! Love gives you wings! For Valentine's Day, board the tethered hot-air balloon in the Parc André-Citröen. At 150 metres above the ground it rivals the Eiffel Tower for fantastic views of Paris and its monuments. Talking of the city’s most famous landmark, why not book a table in the Eiffel Tower’s restaurant 58 for a quiet dinner for two and a panorama of gloriously illuminated Paris. Rooftop terraces are very fashionable in Paris. From the department stores to the Pompidou Centre and the Montparnasse Tower, restaurants and bars perch high above the capital. Cosy and intimate, they invite you to savour exquisite views unless, of course, you only have eyes for each other! For an incomparable Valentine's Day, why not treat yourself to an absolute classic experience; a riverboat cruise on the Seine? In the evening, the city’s illuminated monuments are reflected in the peaceful waters of the river. Glide by the glittering Trocadero and its gardens and witness up close the majesty of the Eiffel Tower. Nothing is more romantically atmospheric than cruising past Notre Dame Cathedral and the charming Pont Neuf beneath the stars. Far from the bustle of the streets, the elegance and tranquillity of a river boat offers the perfect setting for fine dining and the exchange of sweet nothings. For exploring Paris at leisure, opt for the unusual with the Bustronome. This fully glazed double-decker bus offers you a complete tour of the city’s greatest attractions as well as an excellent dinner with ideal pairings of food and wine. Comfortable, original and decidedly romantic!